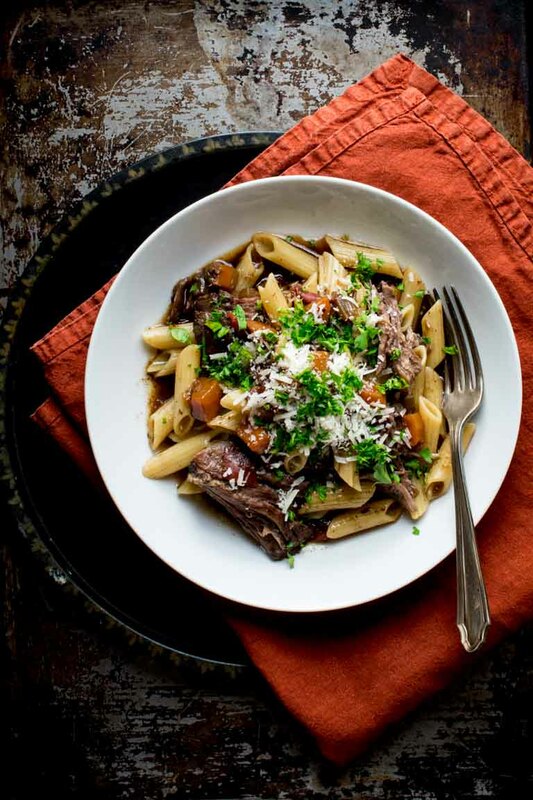 This Slow Cooker Beef Chuck with Pasta and Porcini Mushrooms is just what the doctor ordered on a cold winter night. It is comfort food perfection that is assembled the day before and then braised in your slow cooker, making it an awesome weeknight dinner! It serves a crowd so it also works as an easy entertaining meal! This was one of the very first recipes I ever shared on the blog, on October 2, 2009. 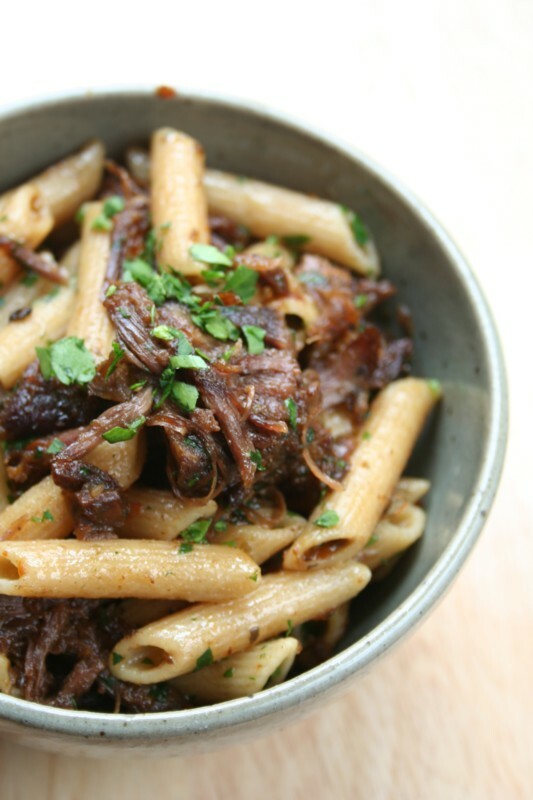 I still make this slow cooker beef and pasta recipe regularly. It was one my mom made for me when we brought my second daughter home from the hospital. It is adapted from Cold Weather Cooking by Sara Leah Chase. I have updated the images and some of the text today. The recipe is super simple. Just rehydrate the dried mushrooms, sear the beef, quickly sauté the veggies, deglaze with a little wine and then pour all the ingredients over the beef and refrigerate overnight. This allows all those yummy ingredients to mix and mingle and become really good friends. Then, the next day all you have to do is throw it all in your slow cooker and go about your day. When you come home the beef will be so meltingly tender you’ll want to do a little jig. After that, just reduce the sauce a bit, toss everything with pasta and sit back and watch your family chow down! It does make a big batch, so it’s also great for a dinner party and I absolutely can’t forget to mention that the leftovers are fabulous. Overall this recipe is a super star! 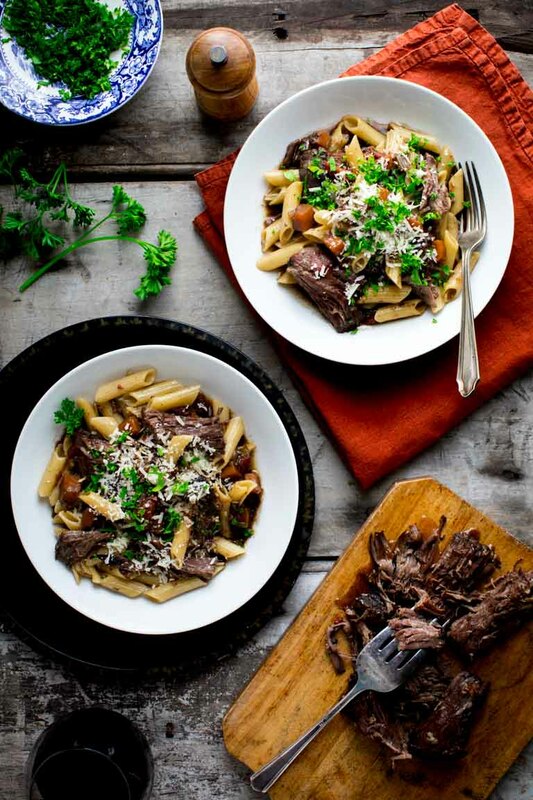 This slow cooker beef and pasta is a full meal all by itself, but if you’re craving something a little lighter or want to stretch this meal for a crowd, I’d recommend serving it with a spinach salad with warm dressing or some steamed veggies. For dessert, you could follow up this hearty meal with vegan hermit cookies and ginger pear sorbet. Because the beef is braised, it reheats really nicely. Just pop it in the microwave until it is steaming hot. Alternatively on the stovetop add in a little water or some of the juices from the bottom of the slow cooker to keep the beef and pasta moist. Heat the leftovers over a low heat and stir every few minutes to prevent anything from sticking to the bottom of the pan. No matter how you reheat the beef and pasta, it’ll taste so good! The pasta soaks up the beef flavors as it sits in your fridge, which makes for super flavorful leftovers. You’ll want to eat this slow cooker beef chuck with pasta and mushrooms within a few days or freeze it for up to three months. 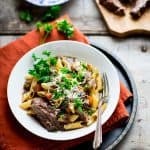 This Slow Cooker Beef Chuck with Pasta and Porcini Mushrooms is comfort food that is cooked in your slow cooker, making it an awesome weeknight dinner! Place mushrooms in a small bowl; Cover with boiling water and soak 30 minutes, lift the mushrooms out of the liquid transfer to a cutting board and chop. Strain the soaking liquid through a coffee filter or cheesecloth. Heat 2 tablespoons olive oil in a large skillet over high heat. Meanwhile, pat beef dry with paper towels. Sprinkle 1/2 teaspoon salt over beef and immediately place in hot oil. Brown beef on all sides, about 6 minutes total. Remove beef and set in the insert of a large slow cooker. Reduce heat to medium-low. Add the remaining 2 tablespoons olive oil to the skillet and swirl. Add celery, garlic, onion, carrot and the remaining 3/4 teaspoon salt and cook, stirring often, until the vegetables are starting to soften and brown, 3 to 6 minutes. Add wine and reduce about 1 minute. Remove from the heat. Stir in bay leaf, tomatoes, stock, marjoram and the reserved chopped mushrooms and soaking liquid. Pour over the beef. Cover and refrigerate overnight. Cook in the slow cooker on low heat for 6 hours. Transfer the beef to a carving board, and pour the cooking liquid into a skillet to reduce. Boil the cooking liquid over high heat until very thick, 8 to 14 minutes. Remove string from the meat. Break the beef into large chunks and discard any fat. Meanwhile, boil penne in salted water according to package directions until al dente. Combine penne, gravy and the chunks of meat. Toss to coat. Adjust seasoning as necessary. Serve sprinkled with parsley and Parmesan. This sounds like the perfect warming meal for those cold nights. 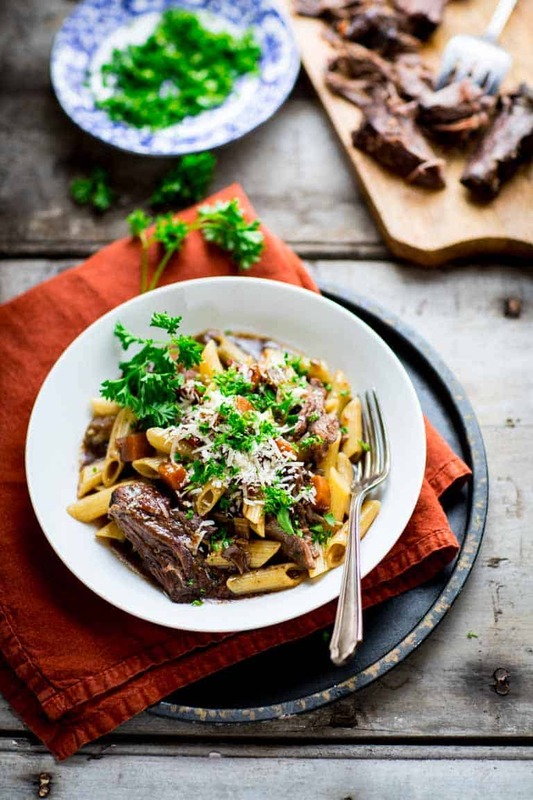 I love beef, mushrooms and pasta so this sounds like a perfect dish for me – will certainly be trying it in my slow cooker. Thanks so much Bintu. Have a great weekend. Love to find yummy recipes for my slow cooker! This looks so hearty and comforting. Slow cooker recipes are always in demand! Thanks for coming by today Ellen. This sounds so good! Pinning to my recipes to try board! Thanks so much for Pinning David! This pasta looks incredible! So hearty and a slow cooker recipe too! I love these kinds of meals – hearty and stick-to-your-ribs! Looks outstanding! Just made this in the Instant Pot pressure cooker–cooked a 1″+ chuck steak for 25 minutes on the “Meat” setting and it came out falling-apart tender and delicious. Nice recipe, thanks. Hi Siobhan. I have yet to do a chuck in my instant pot. I am glad to know it works well and only takes 25 minutes! Thank you so much for coming back to rate the recipe. I really appreciate it!